San Francisco restaurant workers went on strike. With a major storm bearing down, food workers at San Francisco International Airport went on a two-day strike Thursday over a labor contract dispute. The union that represents restaurant workers at the airport, Unite Here Local 2, said nearly 1,000 workers walked off the job in protest against a management proposal that would freeze their health care payments. In a statement, the union urged anyone flying out of SFO to bring their own food. A spokesperson for the airport noted that concession stands and other retail locations are still selling food. The strike comes as Northern California braces for a major storm, with hurricane force winds expected to hit the Bay Area. About 110 flights have already been canceled at San Francisco's main airport, according to Flightaware.com. Saul Ortiz earns $13.85 per hour as a cook and dishwasher at Lori's Diner and Yankee Peninsula, two of the 55 restaurants at the airport. Ortiz lives in San Francisco and says he's struggling to make ends meet after paying for his medical coverage and other costs. "They're making so much money and we're not making enough," he said. According to the union, the proposal would result in workers paying as much as $4,200 per year for health care coverage. The workers say that's unacceptable given the high cost of living in San Francisco. "We're on strike because it is so difficult for our families to make ends meet in the Bay Area," said Jesse Johnson, a bartender at an airport bar, who is also a union organizer. "When restaurants slash our health care, or deny us job security, we just can't get by." The union says restaurant owners bring in nearly $200 million a year. But the average restaurant worker earned just $24,124 last year. Currently, the workers have health benefits and a pension. 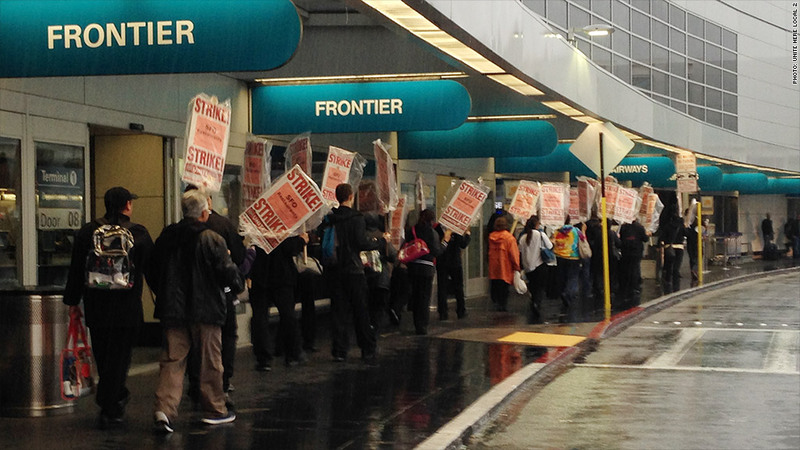 The workers have been negotiating a labor contract with the SFO Airport Restaurant Employer Council, which represents the restaurant owners, for more than a year, said Anand Singh, the union's lead negotiator. Singh said the employers have insisted that they will not contribute "one penny" to the rising cost of health care and have opposed worker's efforts to maintain job stability. "This is a fight over ensuring that workers have access to affordable health care and that their jobs are secure," he said. Singh said talks are set to resume Monday but added that another strike is possible if the owners do not make any concessions. Steve Sarver, owner of San Francisco Soup Company and president of the SFO Restaurant Association, said airport food workers already have a "platinum" level health care plan. Under the owner's current proposal, Sarver said workers would continue to receive the same plan. They have also not shared any evidence that the contributions would be higher. "The restaurant owners are willing, eager and able to continue with the current healthcare plan that employees receive," said Sarver. He said the proposal would also raise workers' pay at a rate greater than the cost of living in San Francisco and would significantly increase contribution to their pension fund. "The union is calling all the shots," he said. "We just want to run our restaurants."